In 2018 I made it to 22 trackdays (and 20 autox events) and I’m scheduled for over 30 trackdays this year (only 10 autox events though). I’ve found that there are 3 factors that determine how often someone makes it to the track: desire, money, and time. How much time and money you start with are going to be determined by your circumstances, but the amount you have to spend and the desire you have to get to the track can be optimized with some planning and wisdom. I started going to the track 4 years ago I had been doing autox for 5 years prior to going to the track with a few events at tracks and even a pseudo-track event where a ‘track’ was drawn out on a huge (half mile by quarter mile) airfield. My first couple of track event was a Porsche Club Time Trial where individual cars ran 3 hot laps at a time spread out far enough to never meet (you’d get red flagged if you caught the lead car and given a rerun to try again for a time, so no passing and no traffic). I also signed up for one of the early SCCA Track Night in America events way back in 2015. Now, if you are interested in going to the track there are 3 basic goals or categories people typically fall into: bucket list/one time experience, people who want to find out what it’s like to go to the track; enthusiasts, people who want to go to the track and have fun with their cars; and competitors, people who have a race series they plan want to compete in and are working towards that goal. I fell squarely into the enthusiast category and most people I meet at the track are in the same camp. If you’re working towards being competitive in a specific race series you’ll start off the same way as the enthusiasts, and even the ‘experiential’ people will have a very similar experience at least at the very beginning, they just stop sooner along the progression path. The very first step is to go out and do an event, I recommend starting with autox since it is the cheapest, lowest risk, and usually most abundant type of event. 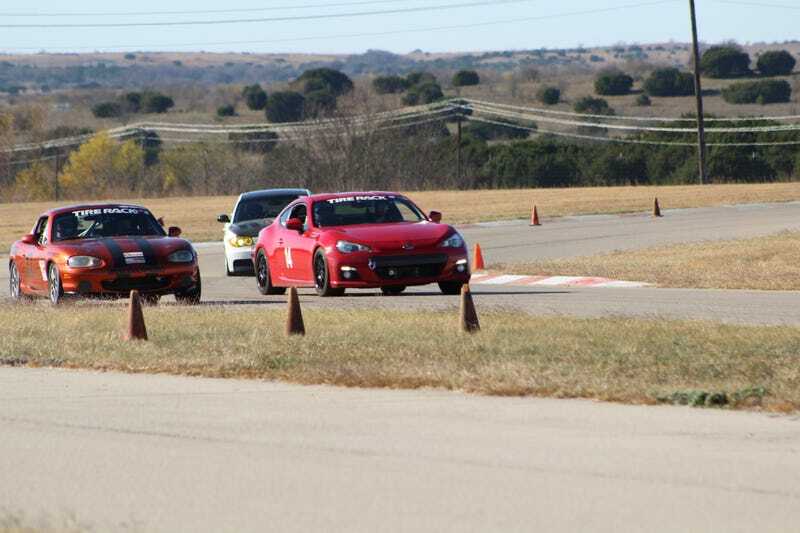 There is no better place to learn car control skills than at autox (try to start with an autox school, then whatever events offer the most runs). If you are new to performance driving I recommend doing about a dozen autox events before you start to really get into the track stuff (3 before your first trackday, then keep at them until you’re comfortable with your car at the limit). When you go to the track, find a group that offers instructors and class sessions (and read Speed Secrets by Ross Bentley). Make sure you keep an open mind and a positive attitude, the happier and more friendly you are the more you’ll learn and the better the time you’ll have at the track. You will be slow. You could show up in any car you can think of and your Miata driving instructor will be multiple seconds per lap faster than you. Don’t worry about being slow, your goal is to get better and faster. The less ego you bring the better your experience will be. Keep getting instruction and keep attending events, you’ll only get faster with more seat time (only spend money on reliability upgrades like oil coolers and safety equipment (as you see fit) like a good helmet, HANS, a seat, and harness). Once you start going to the track, the next step is to just keep going and learning. Once you’re confident in your abilities and understand what you have to do to go fast and be safe, then you can start looking into becoming an instructor. There are only two economically feasible ways to get to the track often: becoming a member at a track with reasonable rates or becoming an instructor. The former isn’t always an option and the later requires some work, a strong constitution, and saintly patience. If you aren’t suited to be an instructor, that’s okay. If you are then you’ve got some research to do. Clubs are almost always looking for new/more instructors. If you’ve been attending events regularly and are a competent driver, you might get approached to encouraged to look into coaching from an organizer or instructor. If not, don’t worry, just ask. Nearly all the clubs you’ll run with have a process for approving new coaches and they are all a little different. The requirements range from anyone with a pulse to a stringent process of classroom and on-track training. If you are ready to coach none of the requirements will be overly onerous, and if they are, you probably aren’t quite ready to start coaching. The two most important skills to have to be a good coach are: communication and feel. You need to be able to tell what the car is doing from the passenger seat before any problems arise and the only input you have is the seat of your pants. Knowing what the car is doing doesn’t do you much good if you can’t communicate with your student what they need to do/know in order to fix or avoid problems. Keep practicing and honing your craft and you’ll continue to get better at coaching (coaching also gives you new perspectives on track and can help you get faster too). You’ll inevitably modify your car and adjust your style, if you’re going to do modifications try to only have to do them once. Don’t buy marginal upgrades only to upgrade the upgrades later. Suspension pays more dividends than power (usually), and figuring out your brake system as early as possible saves tremendous headaches and prevents lots of frustration. Power helps the clock but if you’re not in a competition then that really only matters to your ego (remember, you’re only using all your power when you’re full throttle so if you aren’t spending nearly all your time with your foot pinned to the floor you should just push the pedal harder and not worry about trying to add power).